MERRITT ISLAND, Florida - A brown tide that is plaguing the Indian River Lagoon for over the last month has resulted in the largest fish kill in Brevard County's portion of the lagoon since the 2011-2012 algae Super Bloom. 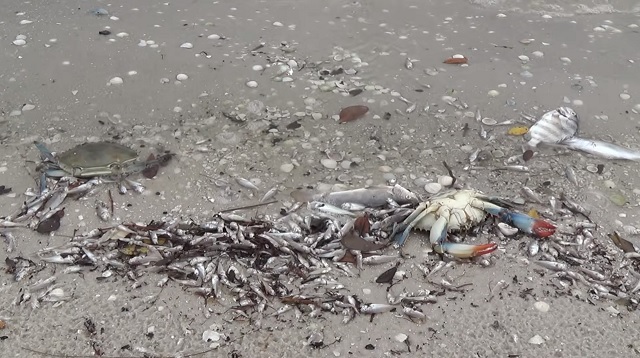 Thousands of dead fish, stingrays, and crabs are washing ashore along the State Road 528 and 404 causeways, creating a potent stench for tourists visiting Cocoa Beach and cruisers making their way to the cruise ships disembarking from Port Canaveral, Florida. Dead or dying blue crab, juvenile whiting, sheepshead, catfish, puffer fish, black drum, flounder, red fish, and speckled trout can be found throughout the Banana River, around the Thousand Islands in Cocoa Beach, and in residential canals. Unseasonably warm temperatures caused by the strongest El Niño since 1997 has fueled the brown algae outbreak in the Indian River Lagoon from Pineda Causeway (State Road 404) northward through the waters bordering Satellite Beach, Cocoa Beach, Cocoa, Merritt Island and Titusville, Florida. The brown tide is now starting to spread into waters south of the Pineda Causeway. Brown tides are caused by the pelagophyte Aureoumbra lagunensis. The algae depletes the dissolved oxygen in the water to such a low level that fish suffocate and die. "This is one of the largest kills on record in the Banana River Lagoon," said outdoors journalist Ted Lund. "I've documented more than 15 species ranging from mullet, puffers, and whiting to sheepshead, snook, trout, and redfish." "This is a clear and present danger to our ecosystem, tourism and property values. And yet state and local governments appear to be mute on the subject. They've declared a state of emergency in the southern end of the lagoon system but are oblivious to what's going on here. Even if Florida had a robust, functioning hatchery system bolstering the populations of fish affected by this event it would take decades to recover." "What has been known as the Seatrout and Redfish Capitol of the world is now the dead fish Capitol of the world." In 2014, the Brevard County Commission passed an ordinance banning the use of fertilizers during the rainy season from June 1 through September 30. The ordinance also requires that fertilizers contain no phosphorous and at least 50% slow release nitrogen. The Commission also raised sewer fees to build more infrastructure to decrease stormwater runoff. However, the Florida Department of Environment Protection (FDEP) determined that stormwater was an unlikely cause of the Indian River Super Bloom. "Despite the county ban on fertilizer you can still go to every Lowe's, Home Depot and Ace Hardware in the county and buy it," Lund said. "It's nothing more than lip service. Until those that sell it are either cited and fined or take some personal responsibility, it's only going to get worse." Like the 2012 Super Bloom, the present brown tide appears to have started in the northernmost portion of the Banana River that is bordered by sparse populations because the federal lands of the Kennedy Space Center, Cape Canaveral Air Force Station, Canaveral National Seashore, and the Merritt Island National Wildlife Refuge make up most of that area's land mass. Many anglers and waterfront property owners have taken to social media to blame the lagoon's plight on the record number of manatees and the unnatural manatee migration patterns caused by the warm water discharges from the FPL power plant in Port Saint John. An environmental group filed a lawsuit in 2014 which contends that such thermal pollution is harmful to the environment. FDEP estimates that manatees are responsible for 1.7% to 6.7% of the total nitrogen loads and 0.7% to 3.0% of the total phosphorus loads entering the Indian River Lagoon system. An 800 to 1,200-pound adult manatee can eat up 10% to 15% of its body weight daily in aquatic vegetation which mostly consists of seagrass. According to a U.S. Fish and Wildlife Manatee Recovery Plan, manatees sometime graze on seagrass which leaves the possibility for regrowth - but manatees also "root" seagrass - meaning the entire plant is pulled and the underwater sediment is disturbed. Based on those consumption rates, an average manatee can consume and/or destroy around 3 acres of seagrass a year, depending on the density of the seagrass per acre. Following the algal Super Bloom of 2011 and the succeeding brown tide blooms of 2012 and 2013, scientists believe the loss of seagrass may have contributed to low dissolved oxygen levels in the lagoon that caused fish deaths. "It is likely that the removal of the photosynthetic potential of leaves by grazing sea turtles decreased the production and storage of photosynthate in the seagrasses, slowing their growth and reducing the ability of the seagrasses to recover from unfavorable environmental conditions. This makes the effects on seagrasses of the grazing by sea turtles similar to the effects of severe light reduction."